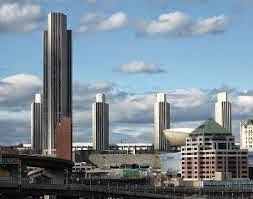 It's a beautiful day in upstate New York, and I'm looking out my hotel room window at the sometimes maligned ("a fiasco", "Battlestar Galactica on the Hudson") sometimes acclaimed Empire State Plaza. This marble and steel extravaganza, the brainchild of Gov. 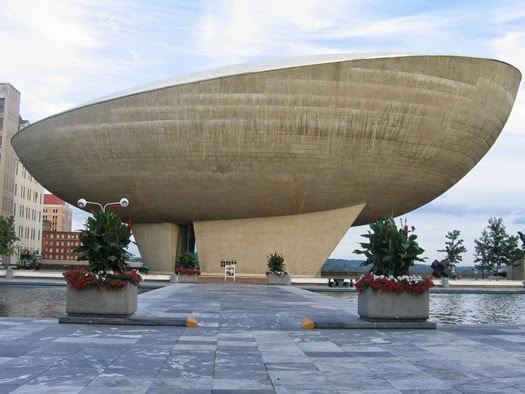 Nelson Rockefeller, was built between 1959 and 1976. 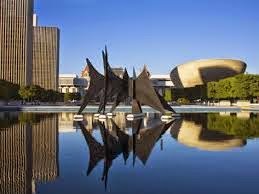 It was designed by Wallace Harrison, architect of the United Nations complex and the Metropolitan Opera House at Lincoln Center (NYC). The cities of Brasillia, Versailles and Chandigarh were used as models for both scope and style. Love it or hate it, it definitely makes a statement! Battlestar Galactica on the Hudson?